Stuffed tomatoes with rice and Traditional Balsamic Vinegar. This is a brand new recipe that moves away from habitual dishes. Aestethically impressive, and beyond tasty. What else would you need to impress your guests? Give it a try! Read more to find out all the details. All the details you need to know to realize this healthy and special recipe. No doubts everybody will go crazy for it! First step is to wash tomatoes and cut off the superior cap. Remove the inner part. Thereafter, gather the pulp in a glass for miniprimers and add 7 basil leaves, 2 cloves of garlic, salt, pepper and a teaspoon of nutmeg, a teaspoon and a half sugar, a bit of olive oil and Traditional Balsamic Vinegar of Modena. Mix everything with the miniprimer, then pour the compound in a small pot and let it cook for 10 minutes, more or less. When it starts to boil, add 2 hg of rice and let it cook for 9 minutes. At this point, pour inside each tomatoe 2 teaspoons and a half of the compound. Fill it until 1 cm from the edge. Cover half of the tomatoe with the cap you cut off at the beginning and let the other half uncovered. Eventually put the tomatoes in the oven at a temperature of 200°. Let everything cook for 25-30 minutes. Last thing you have to do is… eat your delicacy and enjoy it! Hope you liked our suggestion. Let us know how your experiment went and if your guests enjoyed it (even if we’re already quite sure about the answer!). Stuffed tomatoes with rice and Traditional Balsamic Vinegar makes everybody happy! 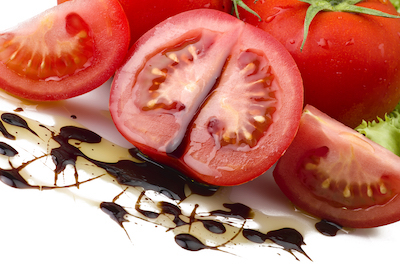 Next Traditional Balsamic Vinegar is first in line.